I name these meditations “Womb of Gaia” with the understanding that “Womb of Gaia” may be a name for Where we are. The altar/mandala here may represent the Womb of Gaia – a Gaian Cosmology or PaGaian Cosmology. This altar/mandala represents for me a Place and a practice where we may enter into Her Creativity, Place ourselves within Her Deep Creativity. It is a Place, in which we are held, and may be held consciously: with our conscious participation in this Creativity. Gaia may be a name for our Place, this Earth (which is another Goddess name … we really cannot get away from Her). And Earth, our Planet, is not separate from Her Context of Cosmos … She is IN it, and we are in Her. Earth-Gaia is not separate from Universe-Gaia. Earth is immersed in Universe. There is no seam that separates Earth-Gaia from Universe-Gaia … She is One. There is no ”up” and “down”. There is no “out there”. Gaia is “in here”, as much as anywhere, or She is nowhere. Gaia can be known, felt, in any single articulation of Herself – within any Self. We are within Her Creativity – participant. Before listening to the meditation, you may like to create the altar in your particular way, and according to your place (see below for instruction, or this video: Creating a Womb of Gaia Altar. You may at least like to have 3 candles – and matches – in front of you and this image below): it is a conscious placing of yourself within Her Creativity – as that is expressed in your Place on the Planet, and in you. Note that the creating of the altar/mandala in itself, is a ritual/ceremony, and may be the main part of the meditation. 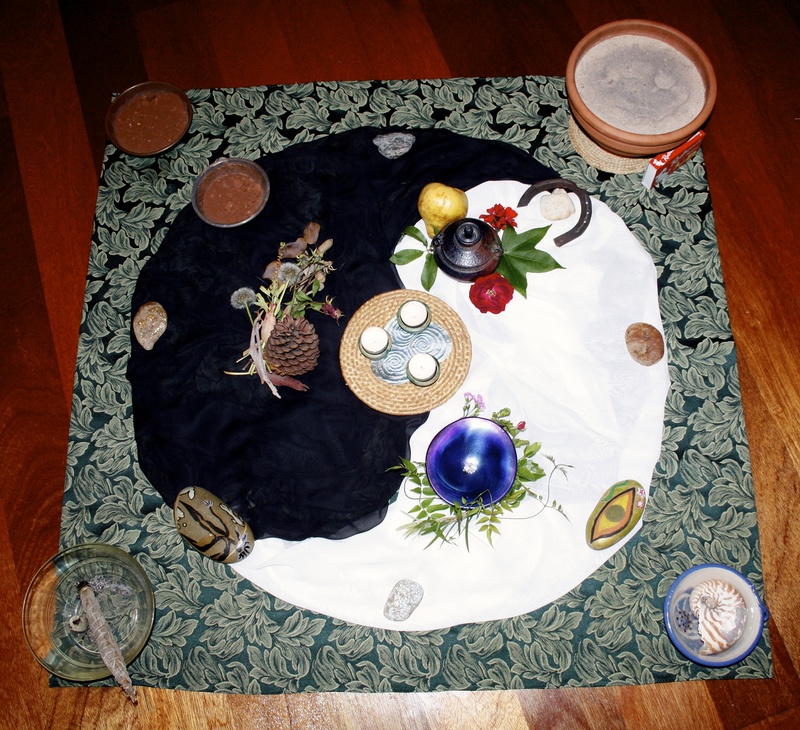 This altar/mandala is the signature of PaGaian Cosmology, and is re-created by students as part of the learning for every Seasonal Moment in the year long on-line PaGaian Cosmology course. If possible, set it up in a space where you may walk around it. You will be walking/moving sunwise, which in the Southern Hemisphere is anti-clockwise. The Placement of Elements: You may choose to place your elements as I have them (Water in East, Fire in North, Earth in West, Air in South): if you are East Coast somewhere it may work well for you, but you could choose where you preferred the elements. If you choose/need to place your elements other than how I have them (and as I place them in the meditation), you will have to translate in your mind when listening. 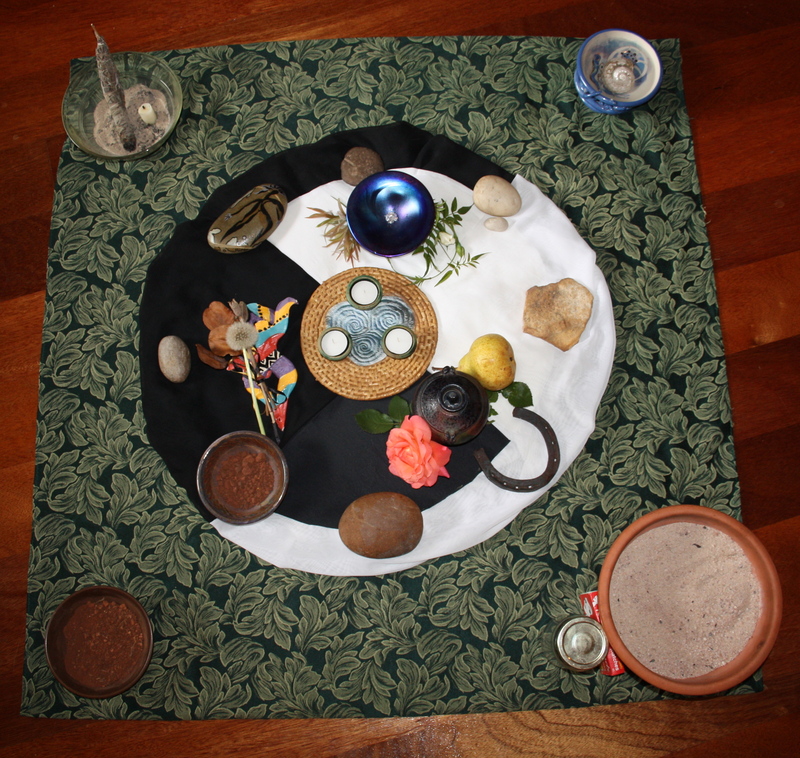 Arrangement of the Circle of Eight Stones/Objects: that represent Earth’s journey around the Sun – the Sabbats/Seasonal Moments from my tradition, and perhaps in your place also. See the diagram http://pagaiancosmology.com/book/chapter-5/ Winter Solstice/Yule is placed in the South, Early Spring/Imbolc in the South-East, Spring Equinox/Eostar in the East, Beltaine/High Spring in the North-East, Summer Solstice/Litha in the North, Lammas/Lughnasad in the North-West, Autumn Equinox/Mabon in the West, Deep Autumn/Samhain in the South-West. Objects to Represent Three Aspects of Goddess – you may enjoy to find things to represent Her qualities for you: Old One/Crone in South-West region, Young One/Virgin in South -East/East region, Mother in North region. If possible, set it up in a space where you may walk around it. You will be walking/moving sunwise, which in the Northern Hemisphere is clockwise. The Placement of Elements: I have put Water in the East, Fire in the South, Earth in the West, and Air in the North. You may choose to place your elements as I have them (Water in East, Fire in South, Earth in West, Air in North): if you are East Coast somewhere it may work well for you. If you choose/need to place your elements other than how I have them (and as I place them in the meditation), you will have to translate in your mind when listening. Arrangement of the Circle of Eight Stones/Objects: that represent Earth’s journey around the Sun – the Sabbats/Seasonal Moments from my tradition, and perhaps in your place also: Winter Solstice/Yule is placed in the North, Early Spring/Imbolc in the North-East, Spring Equinox/Eostar in the East, Beltaine/High Spring in the South-East, Summer Solstice/Litha in the South, Lammas in the South-West, Autumn Equinox/Mabon in the West, and Samhain/Deep Autumn in the North-West. You may or may not find the diagram in Ch.5 of PaGaian Cosmology useful: http://pagaiancosmology.com/book/chapter-5/ it is for the Southern Hemisphere: though the text on it will be useful. Objects to Represent Three Aspects of Goddess – you may enjoy to find things to represent Her qualities for you: Old One/Crone in North-West region, Young One/Virgin in North-East/East region, Mother in South region.